From the mid 19th century, Chinese Export Silver spawned a decorative style that encapsulated the exuberance of a combination of two cultures, the very era itself and the vibrancy that was the China Trade. This made for a unique and interesting mix – the bringing together of these otherwise highly unlikely bedfellows created a force that was to be reckoned with; a force that manifested itself in a decorative style that has since faded into an obscurity it does not deserve, albeit it was not a style one could live with for an extended period of time. How one describes such an indomitable force is no easy task. While excesses in decorative styles are not a new phenomenon, they are usually the result of a logical evolutionary process. Certainly the rococo and baroque periods would comply with this theory while one could certainly track the development of the Art Nouveau and Art Deco movements in all their guises. Sino-Victoriana somewhat contrarily burst upon the scene as if it were one giant firework suddenly exploding. Given China is the home of the firework, perhaps the sudden arrival of this style was perfectly in character. 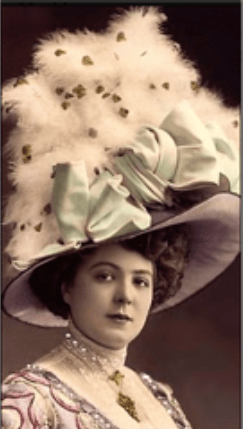 Less is more’ was never part of the vocabulary of the 19th century Chinese silversmiths and if I were seeking a worthy comparable that was a contemporary of those times, I would probably look towards ladies’ millinery of the day – pure confection. 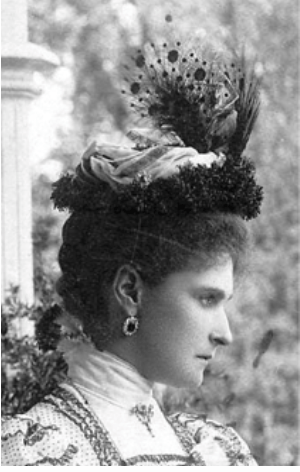 The Tsarina Alexandra Feodoravna [above] is seen here wearing what was, for her, a modest day wear concoction in stark comparison to one of her court ladies [right] who was endeavouring to make a slightly less subtle statement. 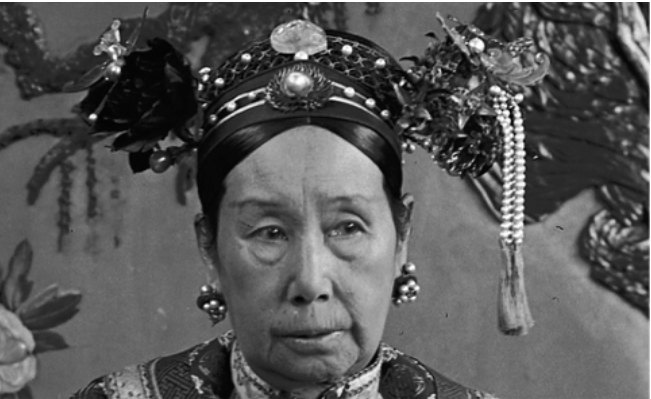 In another Imperial Court much closer to home, the indomitable Dowager Empress Cixi was also not known for her simple head wear, albeit “simple” is always relative to an incumbent context – her normal day wear apparel often defied gravity! Towards the late 18th century, as a result of a vastly reduced amount of raw silver coming from South American mines due to the Mexican fight for independence, Western silversmiths experienced hardship in accessing supplies of silver as well as hugely inflated prices. This ironically coincided with an unprecedented growth of the affluent middle classes across Europe, but particularly in England. It did not take the wily merchants involved in trade with Canton to realize that “Georgian” silver could be made by Chinese silversmiths at a fraction of the cost English silversmiths were forced to charge. 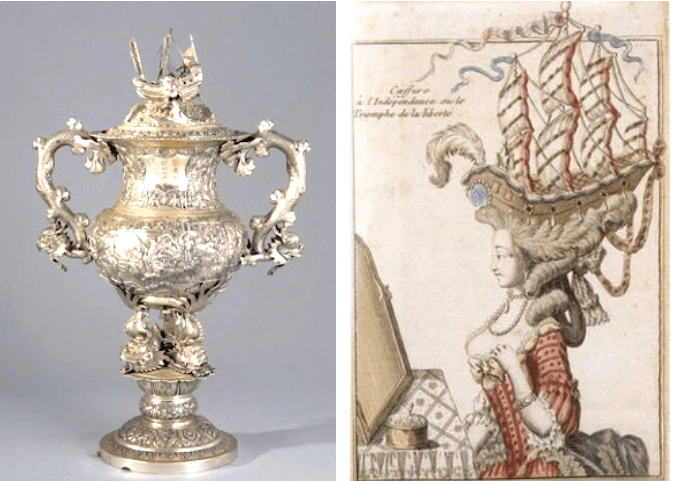 The cost factor was obviously an attraction but more relevantly was the fact that Canton makers could produce the fashionable neo-classical silver at a level of workmanship equal to the finest silversmiths working in London. This new phenomenon was mirrored in Boston in Massachusetts. It was this style of silver in conjunction with the fact it was, for the first time, being made specifically for export that the term “Chinese Export Silver” was coined. Virtually none of this silver was made for consumption by Chinese buyers. 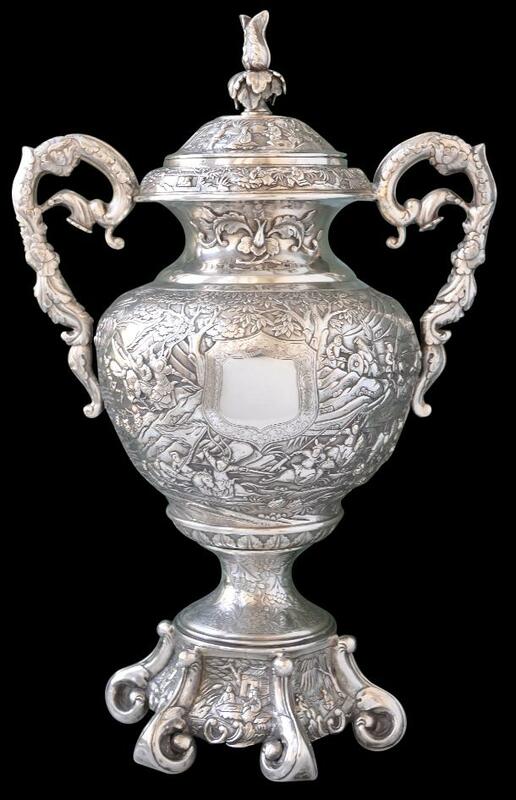 While a significant amount of early Chinese Export Silver was restrained within the confines of the Western neo-classical style, it was the eventual signing of the Treaty of Nanking in 1842 that proved to be the catalyst for Chinese silversmiths to vent their collective frustrated creative bent in what was to be an explosion of silver extravaganzas. In the space of just forty years, Chinese silversmiths took the giant leap from creating a neo-classical lidded jug as the previously illustrated WE WE WC piece to the Luen Wo lidded standing cup below. 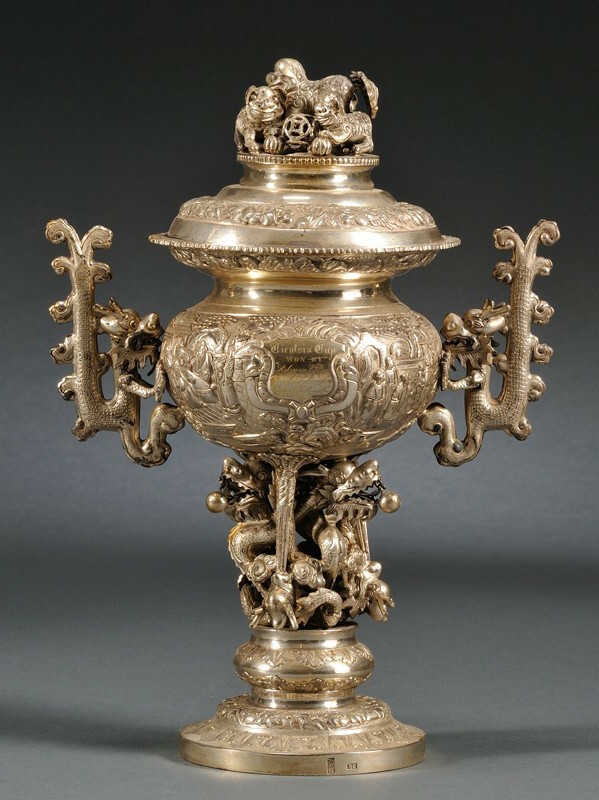 The trophy, as an item of silver, was almost a god-given gift to Chinese silversmiths. It provided them with a blank canvas to create increasingly more extrovert expressions of their fertile creative minds, their obvious sense of humour and their extraordinary artisanal skills. The amount of commemorative trophy items that was created in Shanghai and Hong Kong in the latter half of the 19th century was extraordinary, but so was the number of institutions and clubs that mushroomed in these two cities alone as a result of a Victorian colonial lifestyle. While commemorative silver did not exclusively manifest as lidded standing cups, the end result invariably became cornucopias that overflowed and cascaded with fantastical silver scrolls and curlicues. By the latter part of the 19th century, it could be said that the momentum of the growth in wealth creation in Hong Kong and Shanghai superseded that of most European and American cities. 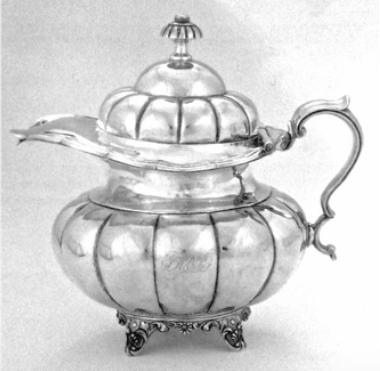 As with anywhere, wealth doesn’t automatically breed good taste and perhaps it was the lack of restrictions Western society placed on what might be acceptable or not that resulted in an over-exuberance that was particularly prevalent in presentation silver made for “home consumption”. This colonial style became a strange mélange of the rococo, traditional allegorical Chinese decorative motifs and the English high Victorian style. 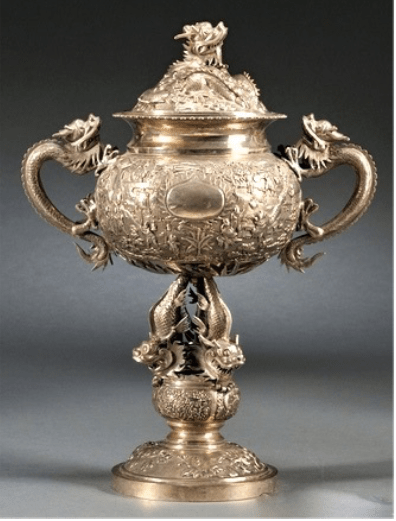 It was vastly different from the style employed for silver pieces in England and America, yet the pieces obviously made for Chinese settlements we obstinately insist on referring to today as “Export Silver” – an oxymoron if ever there was one. Over the 155-year manufacturing period of what we now call Chinese Export Silver there was a great fluidity of styles. In many ways the style spectrum wheel travelled full circle, beginning with the somewhat staid neo-classical and moving into the Victorian era which manifested in an almost organic series of changes that veered to the theatrical, into the 20th century with a rejection of exuberance for the cleaner lines that marked the new modern era – Art Nouveau, ending with what some would consider a 20th century form of classicism, the Art Deco. The inherent theatricality of traditional Chinese decorative motifs made a happy and in most cases a natural marriage with the high Victorian style – a style that threw all previous notions of preserving the integrity of established form and design to the wind and simply piling them together. Much of mid to late Victorian architecture can resemble a wedding cake – layers that travel through architectural timelines that can present Jacobean, Byzantine, Romanesque and Rococo in one single façade. The concept of theatricality is built upon fantasy and to an over-exuberant Chinese silversmith that also has a somewhat wicked sense of humour, the Sino-Victorian style must have been a dream come true. The previously illustrated standing cup that carries the silver mark of the Canton merchant silversmith Khecheong carries a plethora of classical Chinese motifs around an extremely busy battle scene all carried on and within what is essentially a neo-classical form, albeit with a fair degree of artistic license. Sino-Victoriana had no rules other than somewhere underneath the “icing sugar” decoration one will invariably find a neo-classical form. The “Tientsin Cup” in the previous illustration is testament to this. Carrying the Tuck Chang merchant mark, this spirited piece of silver plays to the one-upmanship that lies behind the motivation of why anyone would feel the need to present such a cup at a high profile public event such as a race meet. It is all about status and showing it on one’s sleeve. “Shy” and “retiring” were not words in the nouveau riche Victorian lexicon; Victorians have not gone down in history for their subletly! 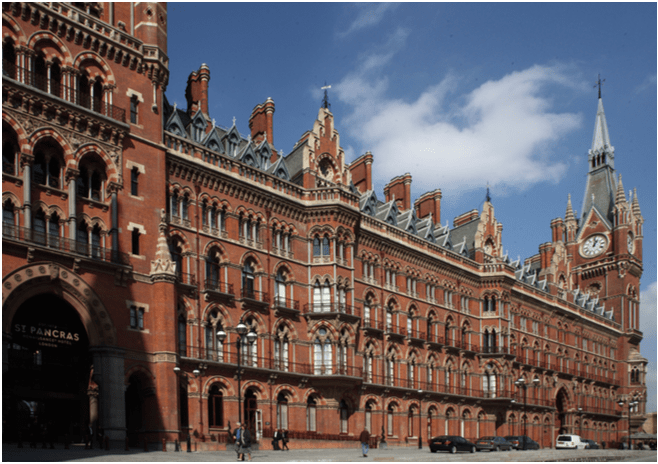 The Victorian façade of Gilbert Scott’s St Pancras Station in London begins with the Byzantine, travels through the neo-Gothic to the Italianate to be topped by a French Mansard roof – the Scottish baronial tower, a mere bauble to set it all off. It is a fruit salad of a building architecturally but it is also a show-stopper. The Midland Railway Company that commissioned it unabashedly stated “It was intended to make a grand statement about the Company with a display of physical magnificence”.